Based on the short story Story of Your Life by Ted Chiang, Arrival is the story of a linguist and others who try to communicate with aliens who had just arrived on planet Earth. Directed by Denis Villeneuve and screenplay by Eric Heisserer, the film is a sci-fi drama that explores the idea of the universe and how humans try to communicate with the unknown. Starring Amy Adams, Jeremy Renner, Forest Whitaker, Michael Stuhlbarg, and Tzi Ma. Arrival is a riveting yet astonishing film from Denis Villeneuve. When news that twelve alien spaceships have landed on twelve different parts of the world, a linguist is hired by the military to communicate with the aliens asking why they’re here as she doesn’t just try to find ways to communicate with them but also cope with the loss of her daughter years ago. It’s a film with a simple story yet it also plays into the ideas that humans aren’t alone in the universe as there could be a way for peace and harmony as it is in the hands of not just the linguist but also a theoretical physicist. The two try to see what the aliens want as they’re aided by a colonel and a CIA official who are trying to communicate with the rest of the world leaders who are doing the same as panic is happening all over the world about the arrival. Especially as the Chinese government have prepared themselves for conflict in case something drastic is about to happen. Eric Heisserer’s screenplay has a very unique narrative that is often filled with flashbacks as it relates to the loss that the film’s protagonist Dr. Louise Banks (Amy Adams) is carrying as it relates to her own daughter. She is also someone that has been detached due to loss where she is asked by Colonel Weber (Forest Whitaker) to decipher anything these aliens are saying where she is reluctant at first but is willing to give it a go. She teams up with Ian Donnelly who works in astrophysics and kind of serves as the film’s comic relief as he takes his work seriously. Yet, once Dr. Banks and Donnelly make some slow but steady progress in communicating with the aliens. Dr. Banks would uncover memories of her own life relating to her daughter as well as other things as she begins to decipher more of their language. When a discovery is made about what they want or what they’re offering, panic does ensue as Col. Weber wants to give Dr. Banks and Donnelly the chance to see what these aliens mean. Especially as so much is on the line as there are those who play into the worst aspects of humanity. 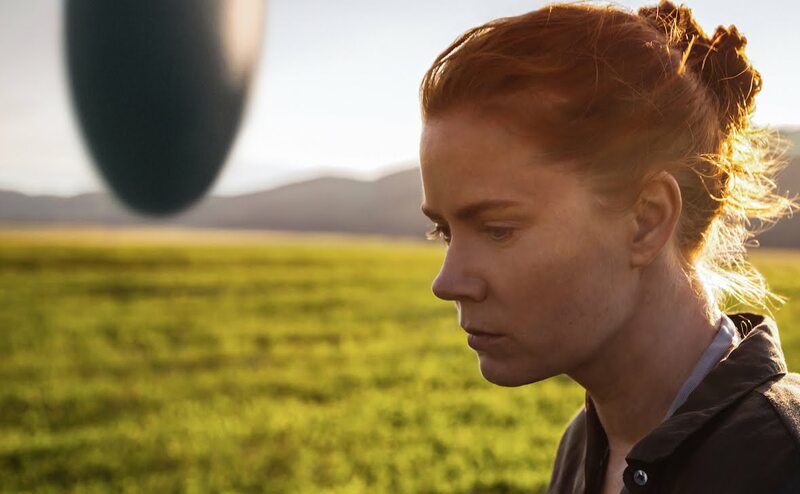 Denis Villeneuve’s direction is truly evocative for not just the images that he creates but also in trying to understand what humanity can do for the good of the world. Shot on location around Montreal as Montana, the film plays into something that is quite otherworldly but also grounded in reality as it relate to that sense of detachment and loss that looms over Dr. Banks. While Villeneuve does use some wide shots to capture the grandness of the spaceship, it is the usage of close-ups and medium shots where the direction is really potent. Notably in the flashbacks as it has this naturalistic quality into what Dr. Banks is experience and dreaming like as well as the way she interacts with Donnelly who is a man that is about fact as he would also give in towards his humanistic traits. There are bits of humor in the film which is often provided by Donnelly during a sequence where he would communicate with the aliens through Dr. Banks’ instructions. Yet, much of the film is told dramatically as there are also some perspective from the world outside as there are those who have no understanding of what is going on where there would be those that give in to fear and cause trouble. The direction would also provide ideas of what aliens would use to communicate as there is a complexity to the language which is crucial to its pacing where it take its time rather than go for something easy. Even when the dramatic stakes are increased as it play into the paranoia of what the aliens might be saying as it might lead into chaos. There would also be these things that would become more abstract in the course of the story as it doesn’t just relate to the fabric of time but also the sense of loss that Dr. Banks is carrying. Its climax isn’t just about the possibility of a better future for the world but also how the good in humanity would be the key to that if they just allow themselves to understand the bigger picture and not give in to fear. Overall, Villeneuve creates an intoxicating and majestic film about humans trying to understand what aliens want on their arrival to Earth. Cinematographer Bradford Young does amazing work with the film‘s cinematography from the naturalistic look of some of the exteriors in the flashbacks as well as the usage of lighting and low-key shades to play into some of the interiors and the scenes inside the spaceship. Editor Joe Walker does excellent work with the editing as it is mostly straightforward with some stylish jump-cuts to play into some of the flashbacks as well as doing some slow-movements to play into the bits of suspense. Production designer Patricia Vermette, with supervising art director Isabelle Guay and set decorators Paul Hotte and Andre Valade, does fantastic work with the look of the interior of the spaceship as well as the military base camp where Dr. Banks and officials work at. Costume designer Renee April does nice work with the costumes as it is mostly casual with the exception of the army uniforms and the suits that characters have to wear to enter the spaceship. Visual effects supervisors Alexandre Lafortune and Louis Morin do brilliant work with the look of some of the exterior of the spaceship as well as the design of the aliens that do look otherworldly. Sound editor Sylvain Bellemare does superb work with the film‘s sound from the way some of the sounds inside the spaceship sound as well as the design of the voices of the aliens created by a team of sound designers as it is a highlight of the film. The film’s music by Johann Johansson is phenomenal as its mixture of low-key orchestral strings with some ambient electronic pieces that include some piano loops and other array of sounds as it really another highlight of the film as the score also feature elements of Max Richter’s On the Nature of Daylight. The casting by Francine Maisler is great as it feature some notable small roles from the quartet of Carmela Nossa Guizzo, Jaydn Malone, Abigail Pniowsky, and Julia Scarlett Dan as the different ages of Dr. Banks’ daughter Hannah, Mark O’Brien as Captain Marks, and Tzi Ma as the Chinese military leader General Shang. Michael Stuhlbarg is excellent as CIA agent Halpern as a man that is trying to deal with the other countries to make sure things go well as oversee the experiment. Forest Whitaker is fantastic as Col. Weber as a military officer who turns to Dr. Banks for help as he is hoping for something that is peaceful as well as protect her and Donnelly knowing that they’re the key to the hope of the human race. Jeremy Renner is amazing as Ian Donnelly as an astrophysicist who helps Louise in deciphering the alien language as well as see what they’re about as he brings some humor but also moments that shows how much he cares for Dr. Banks and wanting to be understanding of the aliens. Finally, there’s Amy Adams in an incredible performance as Dr. Louise Banks as a woman that is carrying a sense of grief around her as she is asked to understand the language of aliens where she would make a discovery of what they’re saying as well as deal with images in her head as it relate to her past as it’s really one of Adams’ most evocative performances to date. Arrival is an outstanding film from Denis Villeneuve that features sensational performances from Amy Adams, Jeremy Renner, and Forest Whitaker. Featuring some amazing visuals, a complex and heartfelt script, and an intoxicating music score by Johann Johansson. The film is truly a sci-fi film that is very smart but also willing to ask big questions along with an idea of hope in a chaotic world. In the end, Arrival is a magnificent film from Denis Villeneuve. Yay! So glad you liked this. Easily one of my favorites this year. YASSS!!! So glad you liked this one. What a brilliantly told movie, all the way around...technically as well as emotionally. Now I need your thoughts on my interpretations! @Brittani-I'm glad to have seen it, finally. It is definitely one of the year's best films and one that the world needs to see. @Fisti-I'm glad we're both on the same page with this film as I'm reading your piece on the film again right now as the answer to your question is.... Yes. YES!!! I'm so happy to see we share the same opinion. What a profound experience this movie turned out to be. @Fisti-Indeed. We need more films like this as we're about to enter a period of uncertainty and lawlessness.